Добавить в корзину 1 шт. на сумму 8 830 руб. 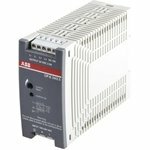 The CP-E range of DIN Rail PSUs from ABB offer enhanced functionality. The switch mode power supply units are economic and can be operated at an ambient temperature of up to 70°C. With adjustable output voltages, they can also be adapted to the application required. This range offers output voltages from 5 V dc to 48 V dc at output currents of 06.25 A to 20 A. Thermal efficiency of up to 90% means that there is low power and heat dissipation allowing operation of the PSU without any forced cooling. The switch mode power supply can be snapped onto a DIN Rail according to IEC/EN 60715, and be mounted horizontally.